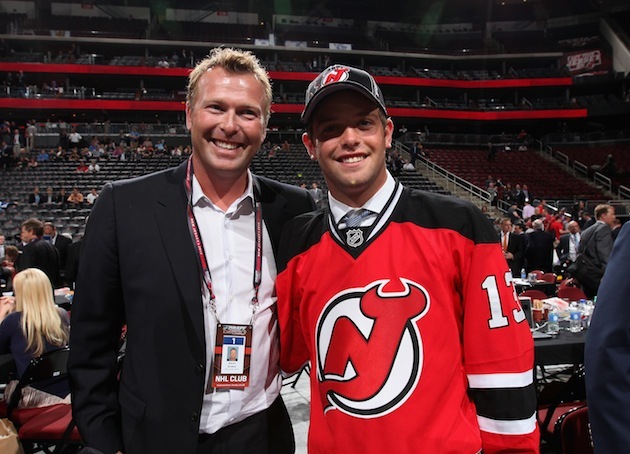 NEWARK -- When the NHL Draft entered its seventh and final round on Sunday, the New Jersey Devils did not have a selection in the final 30 picks. General manager Lou Lamoriello worked some magic already having dealt the No. 9 overall pick to the Vancouver Canucks for Cory Schneider, so to cap off the day, he made a dream come true for his franchise player. It's not often that seventh round picks find a way to a steady NHL career, but the younger Brodeur — who is also a goalie — will be given every chance to earn it. Having played for famed hockey school Shattuck-St. Mary’s Prep in Minnesota, Anthony Brodeur will take the next step in his career by playing for the Gatineau Olympiques of the Quebec Major Junior Hockey League next season. With the Devils having drafted Stephane Matteau's son, Stefan, last year, there will no shortage of storylines relating to 1994 when he possibly faces-off against young Brodeur in training camp.